BlackCEO 19 is the world’s number one conference for black entrepreneurs, leaders, and difference makers. It features an unparalleled networking and support environment for CEO’s Of Color. We help today’s #BlackCEO move beyond their possibility and potential into a new reality of high profitability, and community accountability. We insist on entrepreneurial excellence period! Everyone wants success and yet everyone is not successful. We all face setbacks on the road to achieving our greatest dreams, hopes, and aspirations. We all face obstacles along the path to embrace our purpose. Speakers are needed who inspire hope. Your message should be focused on helping transform lives. Message should include strategies and techniques that help individuals deal with obstacles and challenges faced in life. Ideal candidates include motivational speakers, life coaches and authors. Speakers needed with a core competency in wellness to teach wellness strategies, with a twist of an inspirational message to uplift, encourage and motivate people to eat a healthy diet, get plenty of rest and exercise to live a more fulfilled life. Most of this audience need to reclaim the "best health habits" to have more energy and focus throughout the day and improve the quality of their life. Ideal candidates include wellness experts, fitness trainers, and nutrition experts. Speakers needed with specialized skill set and competency (marketing, branding, social media, communications, finance, technology, sales, etc…) to strengthen the business mindset of entrepreneurs, provide know-how techniques to help entrepreneurs increase results (revenue and employee performance) and have the ability to improve business process. Ideal candidates include business coaches, marketing & branding experts, network marketing leaders, social media experts, and sales experts. Speakers needed with the ability to help the mom, dad, aunt, uncle, business owner rebound, rebuild their confidence in dealing with money. Some speakers can help with creating wealth and have the mastery to help them reach financial freedom. Ideal candidates include but are not limited to those in the financial industry, insurance industry, investment industry, and those in the direct marketing industry. Speakers needed to with expertise to encourage and energize individuals who have had a setback with their employer (maybe they received a low score at their review), their employment (perhaps they have been struggling for years to get the promotion), or their organization (no matter how many professional groups they join they just are not happy). Ideal candidates are employment advisors, transition experts and motivational speakers and authors. Influential is an event like none other. It is a global platform guaranteed to change the lives of everyone involved. We started with three simple goals CHANGE THE WORLD, GIVE HOPE, and INSPIRE ACTION. This mission cannot be achieved without the unified efforts of authors, coaches, speakers' trainers, and experts from around the world. 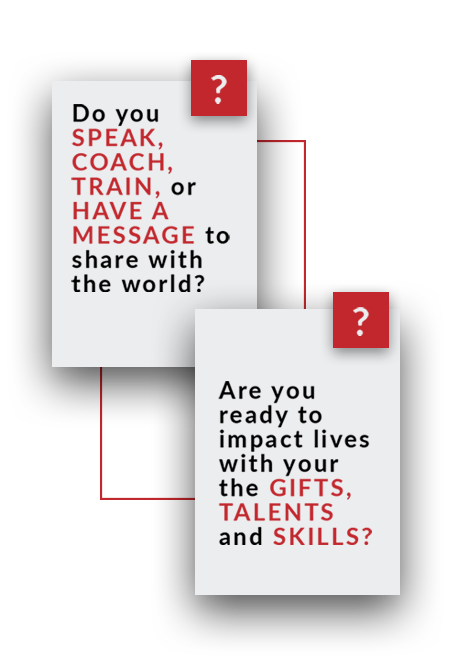 Add your voice to history, add your message on the rolls of destiny, and add your story to the messages of hope that will inspire a generation of world-beaters, world-changers, and world-champions. Let this engine be the rocket fuel that launches your message and your story into the stratosphere. Let’s explore together the universe of unlimited possibilities.